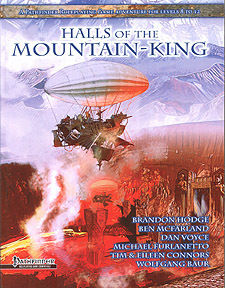 Halls of the Mountain King is an homage to all the great delves, from the Mines of Moria on - with a few new twists. The dwarves of the Rygar canton were a hard working group, mining ever deeper and pursuing ore into dangerous territory. This dungeon goes from a snowy mountaintop spire down through the great halls and works of a vanished clan, and into the depths of the earth. Rumours of a huge gold strike lured miners and speculators into the mountain, but as winter came, the old mines grew deadly. The passes are snowed in. Airships failed to arrive with supplies. New monsters, a sinister brotherhood, and secrets locked away for centuries all boil to the surface in a series of challenging and original encounters. True heroes adventuring in the Ironcrag peaks will find out whether the easy money is, perhaps, not so easy after all.